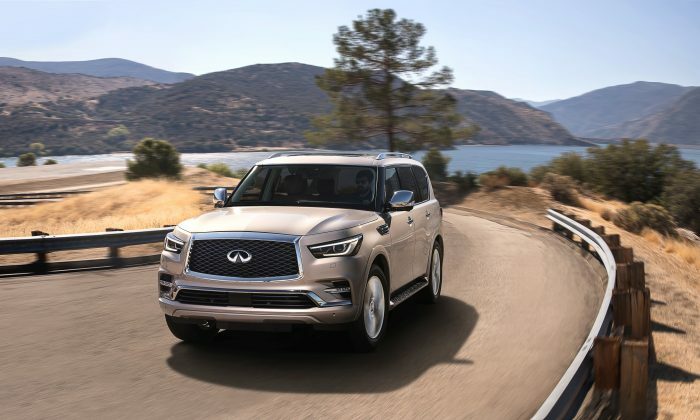 The new Infiniti QX80 has been designed and engineered to allow you to travel everywhere in luxury. This big, beautiful flagship SUV features a high-quality, handcrafted interior, which creates a driver-centrist, passenger-minded space for modern luxury travel. It provides for seven or eight passengers while retaining supreme space and technology and providing a highly sophisticated automotive environment. Infiniti has partnered an advanced suspension with a powerful 5.6 L V8 engine. Both two- and four-wheel drivetrains are available. Direct injection tech contributes to responsive acceleration. The Variable Valve Event and Lift (VVEL) technology work to produce a maximum brute of 400 horsepower and 413 lb.-ft. of torque while improving efficiency. The smooth-shifting seven-speed automatic allows the driver to tap into this available power at any time. This auto transmission features Adaptive Downshift Rev Matching to provide smoother gear shifts while slowing down. As a whole, the RWD powertrain consumes 14 mpg city and 20 mpg highway. To be more competitive, Infiniti must increase the fuel economy, even though the V8 is a powerful mechanism. The 2018 QX80 is 210.2 inches long, 75.8 inches tall with roof railings, and 79.9 inches wide. The interior has Japanese design written all over it, with geometric and organic shapes combining power with elegance. It expresses solidarity and power from all angles. The 121.1-inch wheelbase complements the mammoth height and length, making the vehicle stable and appear longer. A thin accent strip of aluminum beneath the grille emphasizes width, while the grille itself sits more upright. The leading edge of the hood extends 3.5 inches forward and sits 0.79 of an inch higher, allowing it to appear more square. Visibility is good because of the flatter hood. Since the lower section of the bumper is raised, the visual center of gravity is elevated. The headlamps wrap attractively around the front corners of the hood and the fender. As they taper, the lamps lead into a strong straight shoulder line that runs from the grille all the way to the rear. Upright air vents aft of the front wheel arches pair with the wider aluminum sill step running between the axles, offering a more muscular profile. The rear displays a simple appearance but with clearly defined details designed to raise the visual center of gravity. Sharper, thinner tail lamps, straight character lines for bodywork and light units, and a lower bumper section add to the pronounced athletic posture. The QX80 is available with nine paint finishes, including solid metallic paint like Liquid Platinum, Smoky Quartz, and Graphite Shadow, plus pearlescent finishes such as Hermosa Blue and Macha Almond. Inside, the QX80 has a spacious and luxurious cabin with quality materials assembled with a handcrafted feel and advanced technology. The cabin is furnished in either leather (standard) or semi-aniline leather with color-contrast piping. The redesigned steering wheel and shift knob are also wrapped in matching leather trim. Higher-density padding is used, making leather-trimmed surfaces such as doors and armrests firmer to the touch, providing an even greater feeling of robust quality. The cabin is quiet at highway cruising speed. A range of soundproofing materials enhances the refinement, isolating the cabin from outside noise. A wider soundproofing area behind the dashboard panel reduces engine noise, and denser floor carpet and other materials around the cargo area help to absorb high-frequency noises and vibration for the road. The only problem I found with the cabin was lack of small storage spaces. There were cup holders, but an ashtray-size open compartment would have been perfect. The InTouch infotainment system is easy to command through touchscreen icons and customizable smartphone app. The nav system on the 8.0-inch touchscreen provided excellent accessibility. However, the entertainment system presented a small problem—I could not find access to the sound system that allowed you to reset the bass or treble. 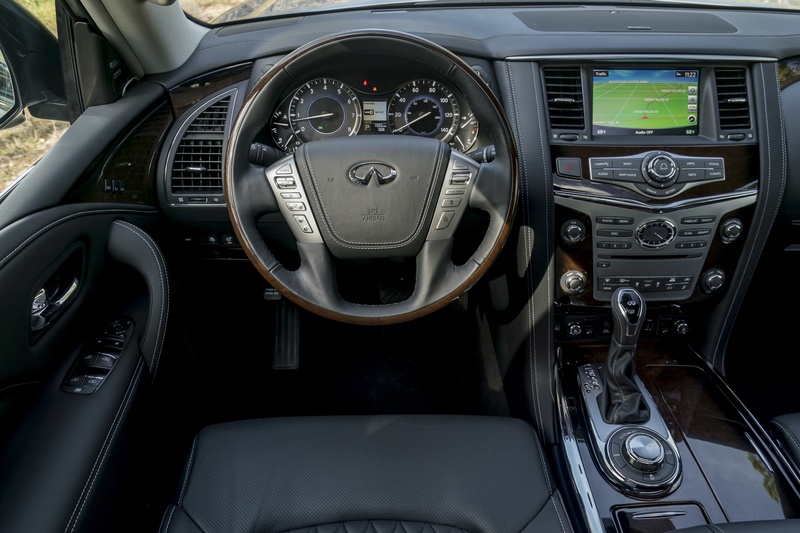 The QX80 has a wide range of technologies to inform the driver of his or her surroundings and to help avoid hazardous conditions. These techs include lane-departure warning and prevention, intelligent cruise control, distance-control assists, predictive forward collision warning, blind-spot warning, and backup collision intervention, to name a few. The MSRP ranges from $64,750 for RWD to $67,850 for 4WD.